For stepping on the court during the final minutes of the game, Kevin Love could get suspended for Game 2 of the NBA Finals. Despite LeBron James’ career playoff-high 51 points, the Cleveland Cavaliers did not manage to steal Game 1 of the NBA Finals on the road at Oakland as the Golden State Warriors prevailed in overtime. J.R. Smith’s malfunction at the end of regulation may have costed the game for the Cavs. 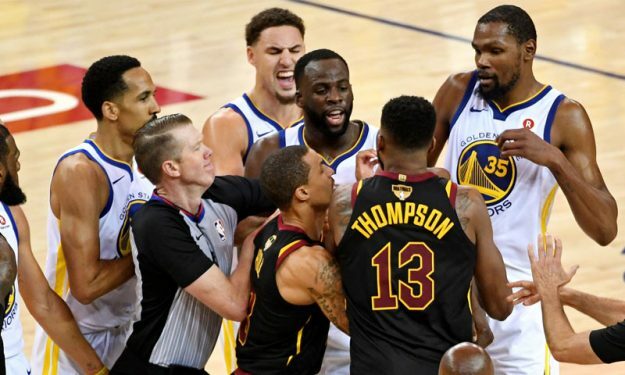 In the final minutes of overtime, Tristan Thompson and Draymond Green exchanged a few words and came face to face, and Thompson got ejected which means that the league will review his ejection and if he will be available to play in Game 2. Kevin Love tried to be the peacemaker, and thus he left the bench during the play. As the rule states, a player can’t step on the court during a play. Love, however, is not worried about a possible suspension, as he told ESPN.